We all know that seed-based diets are harmful for our parrots, and in our last post, we took a look at two of the most popular pelleted diets for companion parrots (Zupreem & Harrison’s brands); in this post, we’re going to discuss why those foods – and other grain and soy based pelleted diets – aren’t the best choice for your bird’s staple diet if you want them to experience health and vitality. Feeding a diet based on soy and grains is asking for problems in the long term.Why? The vast majority of parrot species did not evolve to eat grains, and there is no species of parrot that evolved to eat the modern, lab-created genetically altered and hybridized grains we have now. Soy isn’t a natural food source for parrots, and is toxic to all monogastric animals when fed raw. Soy must be processed using high-heat to be edible by most species of animals, including humans and parrots; in short, it must be processed to death in order to even be edible! There’s also significant evidence that soy hinders assimilation of important nutrients, like calcium and protein, among other things. “Granivorous” parrot species include Budgies, Cockatiels, and some cockatoo species, and some species that evolved to eat a diet consisting mostly of nuts (like the Hyacinth macaw) are also considered granivorous. But even amongst the species considered to be granivorous, the diet still consists of 20-50% foliage, leaf buds, flowers, fruits, berries, and insects. Most importantly, the grain-seeds that these species have evolved to eat are not the same as the grains we offer them in captivity; domestic grains are different in nutritional content – and have completely different DNA – than wild grains, and many are more difficult for parrots (and some humans) to digest. Gluten grains – like rye, barley, and wheat – are difficult to digest and put an enormous strain on the digestive systems of humans, so one can only imagine the havoc they can wreak on the sensitive systems of parrots, who have, with few exceptions, evolved to consume a diet rich in living greens and phytonutrients. Gluten intolerances and allergies have been linked to several health problems in humans, including depression, chronic indigestion, and chronic Candida albacans (yeast) infections. In parrots, yeast infections are fairly common and can result in a bird that is listless or “depressed” and likely over-preens or plucks it’s feathers. Grain-based pelleted diets are also likely much higher in protein and fat than most species are designed to consume, since commercially available diets for parrots aren’t based on the little that we know about the diets of wild parrots at all – instead, these diets are based on what we know about the poultry industry! Parrots aren’t chickens, and they shouldn’t be fed like chickens! Rather than grain-based diets, Carolyn Swicegood of Land of Vos advocates for a diet rich in fresh, raw foods with an emphasis on leafy greens…and I agree! Why? All wild parrot species’ naturally consume a raw diet of greens, berries, fruits, and other living foods. Tamed, but otherwise wild, animals have identical digestive systems as their wild counterparts. Loaded with natural, easily assimilated vitamin A. Contain folic acid, magnesium, and potassium, among other vital nutrients! I have personally seen a great difference in my adopted parrots since switching them to a greens-based diet. My Jardine’s, who I’ve had since she was about 6 months old, hasn’t eaten a grain-based diet since we brought her home. She was immediately switched to a diet consisting of fresh, live food, raw leafy greens, veggies, fruits, and nuts, and remains the best looking Jardine’s parrot I have seen in captivity. Blood testing also shows that her vitamin and mineral levels are perfect. The birds I’ve adopted – a Senegal, a Cape parrot, and a Hahn’s macaw – were not as lucky and their behavior and appearance made it obvious. My adopted Senegal was fed a diet consisting of about 85% Harrison’s High Potency pellets, with the remaining 15% of the diet comprised of Harrison’s Power Treats, bits of apple, pasta, and junk food like bread, pretzels, and chips. This diet was at the recommendation of his previous owner’s veterinarian – that the bird be fed a diet consisting of a minimum of 80% Harrison’s High Potency, and up to 20% “treats” (which the owner interpreted as human junk food.) The feathers that he still had were dull, and had a lot of stress bars. His feet were always red, flakey, and inflamed-looking; he was underweight, listless, and aggressive in and out of his cage. Is it any wonder that this poor little bird developed gout and over-preened, plucked, and mutilated himself? My Cape parrot was fed a diet consisting almost entirely of cooked white pasta (with frozen corn, peas, and carrots, thrown in every once in a while), sunflower, and safflower seeds. She was deficient in nearly every vitamin and mineral you could think of, was about 60 grams underweight, and her feathers looked horrible. She was a “mild” plucker, and her feathers looked ragged, worn, and dull. Some of her feathers were orange or white (when they should have been green) from follicle damage caused by plucking, and from a lack of nutrition. Her beak was flakey and slightly over grown, her feet were dry and scaley, she was physically weak (unable to move about her cage or grip a perch properly) and she was always sleeping and irritable. She is about 11 years old, and even after 8 months with me she is still recovering from 10 or so years of poor nutrition – her feathers are growing back slowly but surely, though they are brittle and break easily, and she is up to a normal healthy weight. The little Hahn’s that I shared my home with all too briefly did not fare as well as the other two. At barely two years old, he had liver disease so severe that it killed him. He was weaned onto a diet consisting nearly entirely of sunflower and safflower seeds – which would have caught up with him, eventually – but what did the damage was that his previous owner thought it was “funny” to give him alcohol. During the three months that he lived with me, he screamed nearly constantly, was incredibly fearful and aggressive, and refused to eat much of anything besides dry seed. Surprisingly, he was not a plucker, but he did over-preen and was covered in damaged feathers and stress bars. He came a long way in a short time, but his life was cut short because his humans made poor decisions. Though my little Hahn’s didn’t make it, my Senegal and Cape parrots are fast on their way to becoming vibrant, healthy birds, with vibrant, healthy feathers, and I owe it to a diet based on greens and raw, live food. They deserve it! In our next post, we’ll take a look at “mash” diets, the nutritional needs of different species, and how to make feeding a fresh-food diet as easy as 1-2-3! So what your saying is that parrots shouldn’t eat ANY grain, or just not the grains that you mention? Does that mean that you honestly think that parrots should’nt eat any pellets? Hi Ken – thanks for reading! No, I don’t believe that parrots can’t have grains, or that no captive parrot should ever be fed grains in any form. Since the vast majority of captive parrots consume a diet based on grains, it’s clear that eating this way isn’t going to kill them (not right away, anyhow) but that doesn’t mean it’s healthy, or that it’s the appropriate diet for all parrots, or even for most parrots. It is entirely possible for an enthusiastic, well-informed bird owner to provide a well-rounded, healthy, nutritionally balanced diet without ever feeding their birds grain-based pellets loaded with potentially harmful synthetic vitamins and minerals. I do believe that, for most people, feeding pellets is a necessary evil simply because most bird owners are either uninformed or do not have the time or ambition to provide their birds with a well-rounded natural diet. I also believe that parrot owners should be aware of what they’re feeding their birds and how their choices can impact their parrots’ health and behavior. 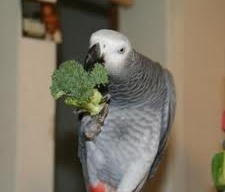 Is a diet based on grains natural or healthy for parrots? No. Is feeding a diet based on mixed, cooked, human-grade grains with some veggies and fruits thrown in better than feeding them a monotonous diet of artificially colored, flavored, and preserved “feed grade” grains? Absolutely.